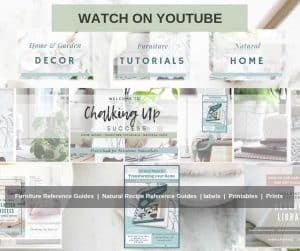 A mood board saves you time and money | How to make one - Chalking Up Success! ‘I’d really love to do more with my space but I don’t know where to start’. I can’t tell you how often I’ve heard people tell me this. 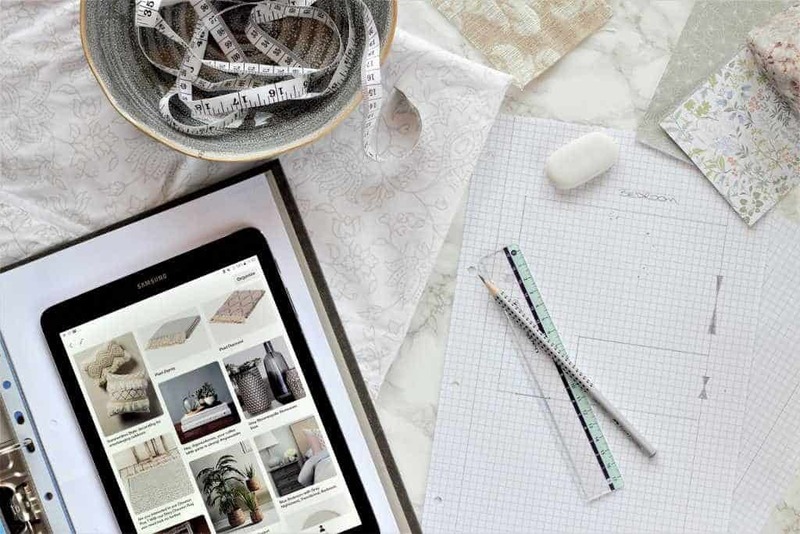 I agree that planning changes in your home can be overwhelming, especially considering the huge amount of choice available to us through online shopping. If you’re anything like me, you like a variety of styles and colour schemes which can make it hard to settle on a certain aesthetic. This is the reason why most people give up before they even start! After writing my last post How To Create A Beautiful Boho-Chic Pallet Sofa I realised, how important making a mood board has become to me and how it not only simplifies my decision making but also saves me time and money in the process. 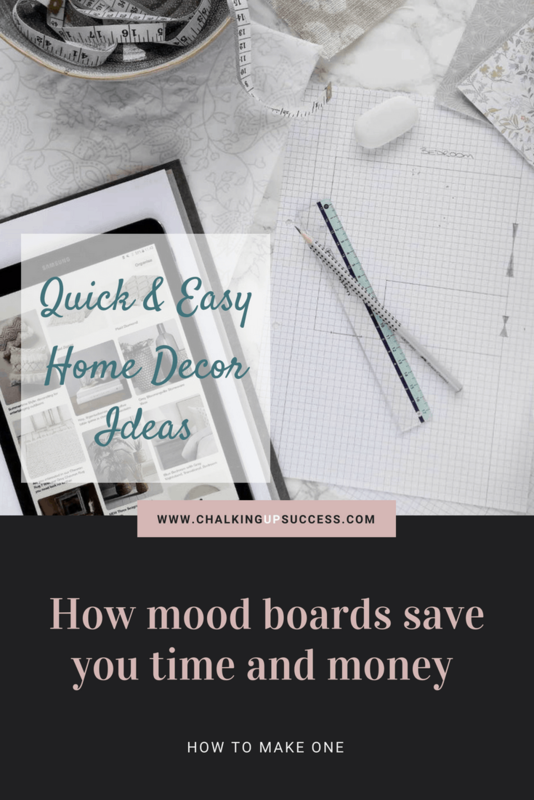 That’s why, whether you’re planning on making changes to one room or to a whole house, my number one tip for you is that you take the time to make a mood board before you start. A mood board is a collection of items which inspire a certain theme. 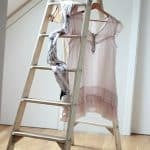 For home decorating purposes, these items could include, samples of fabric or wallpaper, paint swatches, prints and photos. A mood board doesn’t just have to be a ‘board’ though. For instance, for my balcony seating area, I put together a ‘mood corner’ in which I gathered together all the things I thought might work in that space. This included cushions, throws, lanterns baskets and other accessories. Seeing it all together like that made it easier for me to see which items worked well together. I also took a photo of this ‘mood corner’ so that I would be able to look at it on my phone if I spotted something when I was out shopping. This way, I could see right away if that item would complement the rest of my ‘collection’. Making a mood board really helps you to focus on the look your after and means you’re less likely to make impulsive buys which you may later regret. A mood board also helps you to see which elements are ‘missing’ in your arrangement so you can quickly start working on those areas. The time saved in returning items is worth its weight in gold. It’s so easy to make the wrong colour choices when you don’t have a mood board to fall back on – often you’ll find that what looks like a great match in the shop, turns out to be the wrong shade when you get it home! Using a mood board also means, you know exactly what you’re looking for and you can grab any bargains you see when you’re out shopping which fit the bill, because you know they’re going to look right. 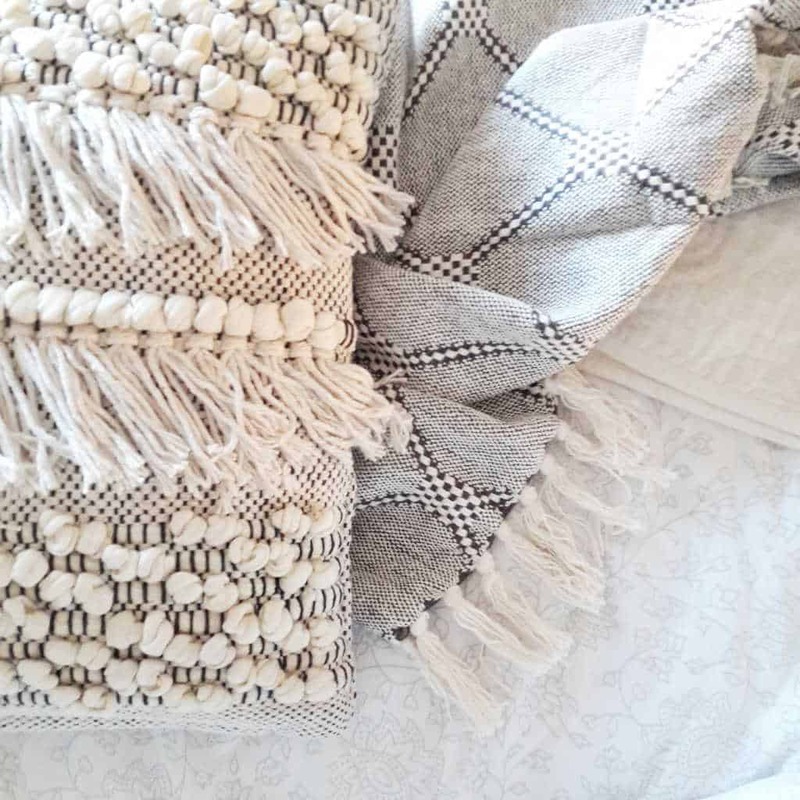 Take a look at the post How To Create A Beautiful Boho-Chic Pallet Sofa to see how I made huge savings on some items I bought for my outdoor seating area. There’ll be no more expensive mistakes if you work with a mood board. You’ll be buying items you already know complement your look. Once you have your mood board created, you can shop your house to see if you already have items which would work with your chosen aesthetic. I did this for my balcony seating area and was surprised at the number of items I was able to put together. Then you can concentrate on buying only those items you really need and won’t end up with duplicates. One of the things I hear most from people when it comes to home decorating is that they are afraid of making mistakes. Making a mood board not only removes this fear, it also builds confidence. The more you practice putting mood boards together, the quicker you’ll begin to get a ‘feel’ for what works in your spaces and what doesn’t. With each successful design, you will become more confident in your decision-making process. I find inspiration for my mood boards everywhere! Pretty cards or wrapping paper, magazines, prints and photographs are just some of the items I use. You can also use items in your home as the basis of your mood board. If for instance, you have a patterned rug in the area which you intend to keep, you can base your mood board on the colours in that rug. In this case, I would just add a photo of the rug to your mood board. You can get paint sample cards in every colour under the rainbow. Take your mood board with you to the shop so you can see which colours complement your look. Most manufacturers will let you have wallpaper samples although, if the wallpaper is very expensive, you may have to pay a small fee for them. 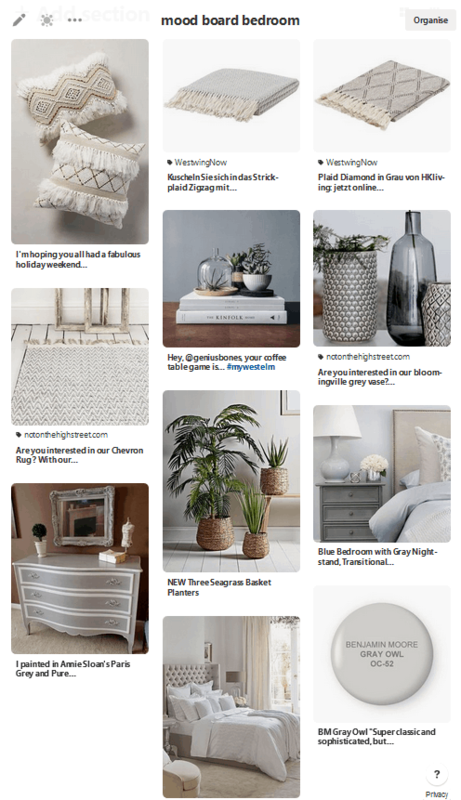 This is an example of a physical and digital (Pinterest) mood board I made for my bedroom refresh earlier this year. I always recommend starting with a ‘statement piece’. This could be a rug, painting, print, or even some wallpaper. Whatever it is, use this as your base and place it in the middle of your mood board. Then you can start adding the rest of your mood board material around it. Don’t worry if you feel you are constantly swapping items in and out. Even using a mood board, creating a great design takes a little time. I usually make mine over a few weeks and simply add to it when I can and swap things out when I find something more fitting. Remember, creativity is a process! This is a fantastic tool because you can pin products to your mood board from any website which has the ‘Pin it’ feature. I use this to start my mood board when I’m in the ‘collecting’ phase. Canva is a user-friendly, intuitive design platform. You can upload your photos and use custom templates to create your design. There is also a paid version but the free version is enough in my opinion. You’ll need to sign up for an account. I was introduced to Milanote earlier this year and it’s become a firm favourite of mine. It’s an all-round tool for planning creative projects. I like it because not only can you upload photos but you can also create text boxes to add your thoughts about a project or make lists of things to buy or make. You will need to sign up for an account first and the free version of this is all you’ll need to start. 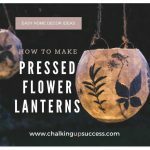 If you found this post helpful and would like to learn more about the mood board process, I have a couple of free resources which you might like. 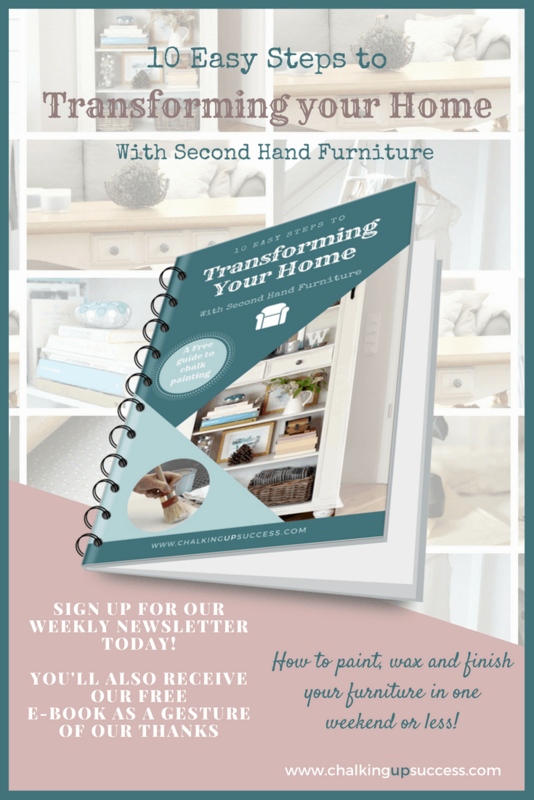 Newsletter subscribers receive my free ebook ’10 Easy Steps To Transforming Your Home With Second-Hand Furniture’ which delves deeper into the mood board process I use. 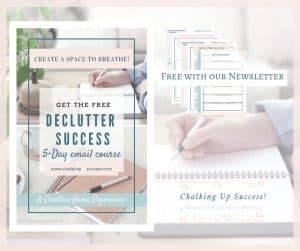 That’s not all though, once you’ve signed up, you’ll receive my welcome pack with even more free resources to help you start planning your dream spaces and turn them into reality! 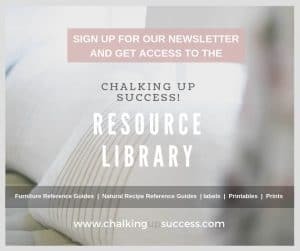 Simply sign up for the weekly newsletter below to receive your free gifts. What a great idea. I have never heard of a mood board. I’m excited to put one together! Glad you like it, Vanessa! Mood boards are so fun to make! And I agree, they do help save time so you know what you really want! Hi Brooke, yes and no mistakes, that’s precious! How exciting! I’ve never heard of a mood board before, but I can see how this would definitely create a visual to bring a room together. I will definitely do this next time I’m decorating a room. Great tip! Oh yes, you should definitely try it, Candice. 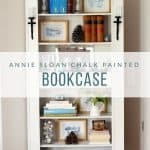 It’s a fantastic tool for decorating.